Sometimes having two matches doesn't matter, and that was the case for NYC FC and Chicago last week. David Villa and Maximiliano Moralez were great against Chicago, but then they didn't play at Minnesota and finished with fewer fantasy points than Ronald Matarrita. In the end, it was better to give the armband to players with favorable single matches like Nicolas Lodeiro, Luciano Acosta and Zlatan Ibrahimovic. Luckily, that's not an issue in Week 32 because there are no midweek matches. It's no surprise that Atlanta are at the top of the captaincy list at home against a Revs team that gave up four in Toronto last weekend and two at home against Chicago the match before that. Josef Martinez has cooled off without a goal in four of the last five matches, but he'll still be a popular option. I'm more inclined to give the armband to Miguel Almiron, who has been more consistent in the last month and has a higher floor than Martinez. Almiron has three goals and three assists in his last four matches, and that includes the 2-0 loss in New York. Toronto still have a slim shot at the playoffs and host a Vancouver side that's lost its last three by a 7-2 score line, including two at home. 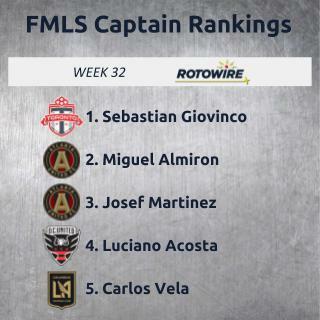 Sebastian Giovinco is the main reason Toronto have a chance, having made the score sheet in his last 12 appearances to go with at least nine fantasy points in each of his last four starts. He'll be hard to fade, while teammate Victor Vazquez is also worth a look since he's back in the starting XI. D.C. United are on a tear and have a great matchup against Chicago, who have allowed multiple goals in their last seven road matches. Acosta continues to be my pick over Wayne Rooney, scoring at least 12 fantasy points in four of the last five matches. After scoring five against Montreal last time out, D.C. may be the best team to back in hopes of another huge performance. Seattle would be higher on the list having scored multiple goals in seven of their last eight at home, but Houston are playing better and could give the Sounders some resistance. Still, all of Houston's wins have come at home, so backing Nicolas Lodeiro isn't a terrible idea. The Uruguayan hasn't been as consistent, but he is coming off a 23-point outing that included one goal and two assists. There are only two other players I'd consider for the armband: Carlos Vela and Bradley Wright-Phillips. Vela should be in for a nice outing in Colorado because the Rapids are losing every match and allowing multiple goals no matter where they are. Vela is usually good for at least seven fantasy points and is another guy who has a huge upside if LA FC pour in the goals. Wright-Phillips has a lower floor, but he could easily score a hat trick against a San Jose team that has seemingly stopped playing defense, allowing at least three goals in five of their last seven matches. And if you want someone else to captain, I don't know what to tell you.